The movie does try to be something that could stand on its own while respecting the films that came before it as well as the source material, but because it is a bit disjointed, it doesn’t flow quite as it should. However, once it finds its footing, it becomes an exciting sword-and-sandals epic that we rarely see on the big screen. It takes place in between 25 and 33 A.D. where a religiously skeptical prince named Ben-Hur (Huston) is asked by his adopted brother Messala (Toby Kebbell), a Roman officer, to keep the roads of Jerusalem free and clear of any rebels when Pontius Pilate (Pilou Asbæk) walks through the city. Of course, things don’t go exactly as planned when an assassin attempts to take Pilate’s life, and Ben-Hur helps the assassin escape and is himself accused of treason. He is virtually given a death sentence, forced to row a large ship with fellow prisoners. Normally, those who are given this punishment live a few short months, but for Ben-Hur, he survived on his will to carry out his revenge on Messala. When an opposing nation cripples their ship, Ben-Hur washes ashore where Sheik Ilderim (Morgan Freeman) nurses him back to health. In exchange for not being returned to the Romans, Ben-Hur now must help Ilderim with his horses. That’s when an opportunity presents itself to the two as Rome plans to hold a grand chariot race, giving Ben-Hur the chance to get his revenge. Jesus (Rodrigo Santoro) even makes a few appearances in the film, more so than he did in the previous iterations. But more on that a little later. One thing that does throw the tone a bit off is the fact that it starts eight years after the events of the film actually begin. We see our two brothers taunting each other before they engage in the iconic chariot race. Then we flashback where we learn more about them. Ben-Hur is a spoiled merchant who has a friendly sibling rivalry with his adoptive brother Messala. Jesus is there as well, often sharing the word of God without being overly preachy. That’s where Bekmambetov shows a surprising amount of restraint, sprinkling in those religious aspects while also realizing that this is a sweeping swords-and-sandals action-drama. That’s where Bekmambetov gets the audience. 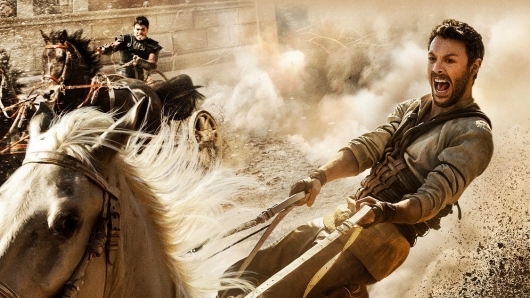 Yes, it would be hard to ignore the existence of Jesus at the height of the Roman Empire or least hint at the religious undertones in the film, but Ben-Hur focuses mainly on the two brothers and their road to revenge and redemption. And the director doesn’t have Jesus randomly appear out of nowhere, but strategically placing him in key scenes that will help with the character development. That bitter defining moment that drives Ben-Hur’s revenge to a breaking point comes through when the title character is sentenced to a certain death by rowing a slave ship. Bekmambetov shows restraint once again during another action sequence when Ben-Hur’s ship is attacked, and rather than see the disaster that is going on around him, the entire sequence’s focus is narrowed to Ben Hur’s point of view. By doing this, the sequence is more intense and can be a bit scary considering that it feels sequestered in a confined space. But it wouldn’t be much of a Ben-Hur film without its signature chariot race that the 1959 film is known for. And that’s where Bekmambetov’s visual style is unleashed. Thanks in part to a couple of GoPros, we get to see the real intensity that comes to the dangerous races that were held during the Roman Empire. Even when audiences get an up-close look at Messala and Ben-Hur as they weave past other racers or even turn corners, and would probably need to catch their breath when other racer’s chariots split into pieces. While also taking place in one space, we get to see just how big this coliseum really is with the roar of the crowd energizing the racers to get first place, or in this film motivating Ben-Hur to get his revenge. It’s not without its faults but Ben-Hur is a surprising action film with a few religious undertones. While that may be a turn off to some, it really doesn’t take away from the overall excitement. It also doesn’t come off as overly preachy, so take comfort in knowing that.